A recipe for Grilled Red Cabbage with Lime Sour Cream Dressing. 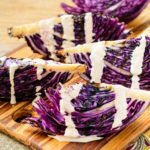 Grilling brings out the sweetness of red cabbage and is complimented with a tart cooling dressing. Heat an outdoor grill or cast-iron grill pan to medium-high heat. Remove and discard outer cabbage leaves. Cut cabbage into 6 or 8 equal sized wedges. Do not cut out the core (it's what holds the wedges together while grilling). Brush wedges with oil and season with salt and pepper. When grill is heated or pan begins to smoke, add cabbage wedges cut-side down. Cook cabbage until it begins to brown and soften, approximately 6 minutes per side. Close the lid while grilling if using an outdoor grill. The cabbage will be crunchy on the inside. If you prefer softer cabbage, turn heat down, cover, and cook until desired tenderness. Serve with lime sour cream dressing. Stir together sour cream lime zest, lime juice, salt, paprika, cumin, and cayenne pepper in a small bowl. Add half-and-half 1 tablespoon at a time until desired consistency is reached. The dressing is best made 1 or 2 days in advance and kept chilled in a sealed container.